This article submitted by Michael Jacobson on 3/29/00. Nolene Stanger's first job was candling eggs for 17¢ an hour. She was 16 then, back in 1931 at the midst of the Great Depression. She finally retired 69 years later, on Friday, March 17. For the past 24 years, she has worked as the office manager at the Paynesville Veterinary Clinic. 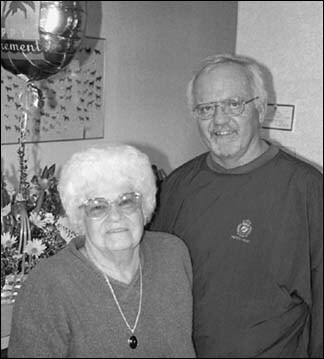 Stanger,pictured at left,who will turn 85 in October, has worked with Dr. Todd Johnson,at right,since he opened the clinic in Paynesville in 1977. Johnson called Stanger his "right-hand gal." Stanger's duties at the clinic included billing and the book work, caring for the animals and cleaning up the facility, assisting with surgeries, and dispatching. "She learned an awful lot about animal diseases and treatments," said Johnson, who sold the clinic several years ago but still works there as a veterinarian. Stanger, who lives next door to the clinic, put in extra hours for emergencies. After hours, she would answer the phone at home or be available for clients needing emergency medication for their pet or livestock. "I enjoyed every minute of it," Stanger said of her time at the clinic. "Not when I forgot places I was supposed to go," protested Johnson, who used to call Stanger his "memory." At almost 85 years of age, Stanger was the oldest full-time employee in the county, maybe other counties, according to Johnson. After growing up on a farm near Paynesville, she took that job at North American Creamery candling eggs (checking them for blood, chicks, etc.) for 17¢ an hour. In almost two years at the creamery, she also worked making ice cream and butter. After her marriage at 18, she moved with her husband to Blue Earth, where he worked on a farm for $35 a month. "Nobody would go out on a farm for that money today, but times have changed," Stanger said. They lived in an actual railroad box car on the farm. Soon they returned to Paynesville, and Stanger did cleaning and washing for income while raising two kids. "We found out you couldn't live on love," she said of the depression. "Many times we didn't have any money." She remembers when her husband switched to the night shift for a nickel extra an hour: 15¢ an hour at night versus 10¢ an hour during the day. Nolene returned to formal employment in 1954, candling eggs again. Only now, she earned 85¢ an hour. She worked at Marshall Produce in town for 22 years before starting at the veterinary clinic in 1977. She said it was time to retire. She loves to watch sports, especially basketball and baseball, but she knows she will have to adjust to retired life. "It's going to be a little bit hard at first," she said. "I've been working so long."